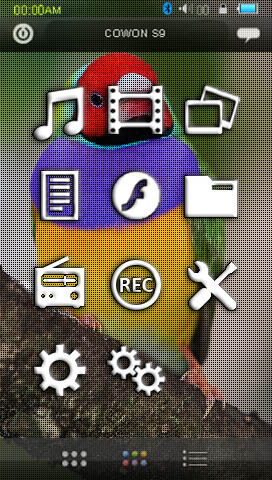 The Wallpaper UI was born out of a need to get wallpaper support on Cowon's new PMP - the S9. Since then the UI has evolved into a User-Customization UCI, allowing changes to numerous aspects of Cowon's original User Interface. The goal was not to engineer a brand new interface, but simply to enhance the existing interface. Please note that Pack 3.48 + Patch 3.49 is the latest non-beta release of Wallpaper UI. Per Screen Wallpaper with ability to assign wallpapers to individual UI components (Main Menus, Widget, Music, Radio, Browser, Record). Wallpaper Timeline to assign wallpapers to be active at certain times of the day. Wallpaper Slideshow to display various pre-defined wallpapers for a customized interval. Theme Wallpapers loading with Custom Icon Themes. Customizable Vignette effect to change the look of your wallpapers. Dynamic Playlist support with ability to track up to 10 playlists capable of holding up to 256 tracks each and edit them on the player. 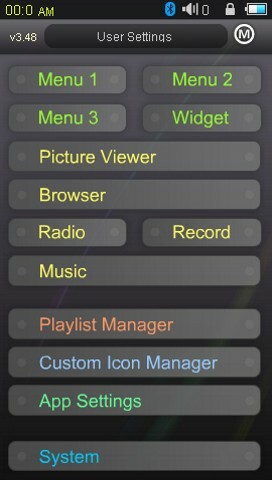 Customizable Music Interface with additional swipe options and the possibility to customize the Music UI footers and the appearance of all displayed play info. Large album art with the ability to customize the default blank album art picture, the album art border and use vignette effects. Artist/Album Hotlinks which allow activating an Artist or an Album playlist based on currently playing track. Custom Icons support with ability to create up to 200 icons which may be used to launch UI components, widgets, or Apps. Modification of menu folder structure and disabling unused stock icons is possible also. Icon Themes Featue to replace all icons easily with icon sets of your choice, including stock icons, icons from Wallpaper UI and all self created ones. Theme Tracker allowing unique themes to be executed together. Press hard Play button in Main Menu 1/2 to start or stop playing music. Use Hard Next/Prev buttons to go to next/previous track while in Main Menu. Ability to toggle Bluetooth mode while in Main Menu. Double-tap on a Picture Widget in the Widget screen to open that picture full-screen. Touch the screen to allow overlays to roll away when in Picture Slide Show mode. 'Clear Favorites' option to quickly delete all favorites from the Music screen. User-configurable settings are accessible via a 'User Settings' icon (located after accessing Utilities Icon). The following links lead to overview tables showing the settings including a brief description of their function along with all possible selections and the default values. Please have a look at the frequently asked questions if you have a certain problem.